Last Wednesday Lego announced that after a long period of being denied due to licensing conflicts, CUUSOO projects based on Doctor Who would once again be allowed on the service. Since then, Lego fans have got their thinking caps on and come up with some pretty awesome ideas. Take a look at some of the best below! This incredibly popular project - it's rocketed to over 6,000 supports of the 10,000 required to reach 'review' status on CUUSOO since it appeared last friday - is a bit more nebulous than the others in that it's not really based on a single specific set or item to build, and more on a stable of characters in an attempt to fit in as much of Doctor Who's 50 years of heroes and companions in as possible - Glenbricker and his collaborator Kaminoan have got some pretty amazing minifigure concepts for Doctors, Companions and Monsters, of which they plan to have about 5-7 of in their set eventually, alongside an adorable brick-built K-9 and three Daleks. What makes this project all the more special is that, if it's successfully accepted by Lego as a set, Glenbricker has offered to give 50% of the creator profits (CUUSOO Users receive a percentage of the sales profits from their set if the project succeeds) to the American Heart Foundation - inspired by The Doctor's own binary vascular system. What makes this set stand out that it is one of the very few Doctor Who projects going that doesn't feature a TARDIS or Console room - instead, it's a brilliant recreation of The Doctor's yellow roadster Bessie, the transport of choice in the 70's for The Third Doctor, and eventually for The Fourth Doctor during the events of Robot. The build of the car is simple yet accurate to Bessie, and the minifigures themselves are nicely designed - particularly the clever use of a hobbit-scaled cape inside a normal cape to recreate the Third Doctor's trademark dandy fashion. Plus the Tom Baker minifigure is essentially just the Frodo one with longer legs, which I find oddly hilarious. Unlike every other project, which focuses on minifigure scaled adventures in Time and Space, S-Taylor's idea for a super-sized TARDIS model in the vein of the Lego Star Wars' line of 'Ultimate Collector Series' models is easily the most detailed police box on CUUSOO. At over 1,800 pieces and a suggest price tag of $100-200, this ambitious proposal might end up being reduced to something a little smaller-scaled if it makes it as a set, but at least for now we can just gawp at this gorgeous, wonderfully designed model. Flailx, who recently took another BBC property, Sherlock, to the review stage on CUUSOO is at it again with this brilliantly inventive TARDIS model. This minifigure-scaled police box attempts to recreate the 'bigger on the inside' nature of The Doctor's Timeship by having the model fold out to reveal the console room. It's a brilliant little feature that makes displaying the model itself a lot more attractive that it just being a small box of blue lego bricks, and makes the project stand out amongst the sea of other TARDIS set ideas. To finish it off, the set comes with two Brick-built Daleks, The Tenth Doctor, and Rose Tyler. Cute! Finally we have this great little playset, one of the first to hit CUUSOO after the announcement last week. 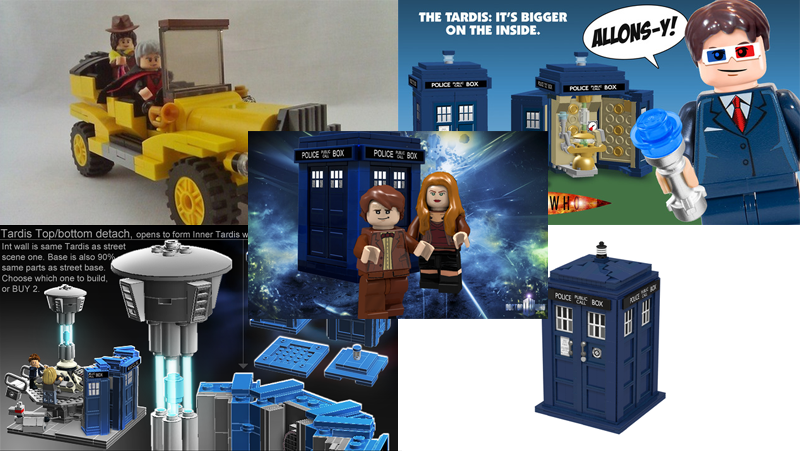 Benefiting from a little scene to place the TARDIS model and minifigures in (including, once gain, an adorable little K-9! ), AndrewClark2's wonderfully detailed TARDIS set builds on a similar idea to Flailx's by having the TARDIS fold out into the console room, but on a slightly grander scale - allowing you to display the model either as The TARDIS landed, or with The Doctor and his companion in the console room, jetting off to adventure. The final set will include 4 minifigures, a Doctor/Companion Pairing from the classic era, and a Doctor/Companion pairing from NuWho, for which Clark is currently taking suggestions for in the comments on the project page. You can check the Doctor Who tag on CUUSOO to see any other project suggestions, and don't forget - if you see one you like, sign up for an account and support it!